This was a good plan; although we could have ridden today, we were clearly becoming more fatigued and a little sore. We had a leisurely breakfast that stretched to 10am; quite a luxury after 4:30am rousings followed by gulping down enough bread and peanut butter to keep us going through our morning runs. 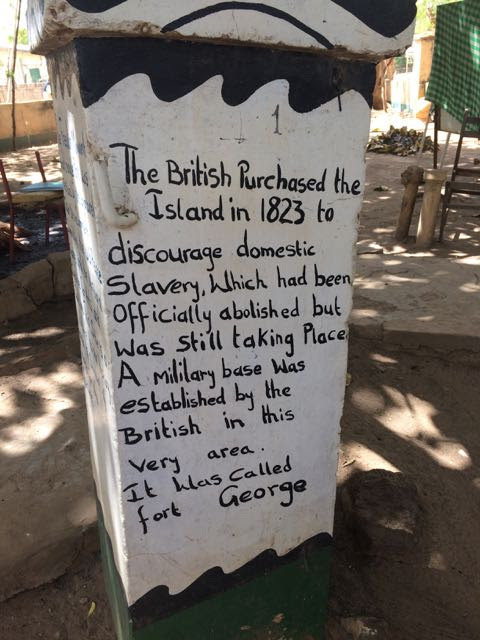 We then visited the most famous landmark of this island, the slave market. This was a key trading post in the awful slave trade saga that finally ended in the 19th century. Captured Africans were brought to the buildings along the banks of the River Gambia. They were held, often for weeks, until there were enough to fill ships going to the coast. Those who resisted were placed into a subterranean room smaller than an average classroom and with a 5 foot ceiling. Up to 50 people were placed into the room so cramped that no-one could stand and only a few lie down. Air and food were supplied through small windows near the ceiling. Only the strongest survived. Trading started when the transport ships arrived. Male captives were sorted by weight and females by sexual attractiveness. Males exceeding 80 kg were sold. Lighter captives were given the opportunity to run to the ‘freedom tree’. If they could touch it, they were branded and freed. The obstacles to touching were a brigade of British soldiers and, if captives got past that, vicious dogs. Those that failed (almost all) were thrown into the river where they either drowned or eaten by crocodiles. Many were complicit in this abominable trade, Arab, Portuguese, French and British traders and African tribes who had no difficulty arranging for enemy tribes-people to be captured. While officially banned in most countries, this blight on human morality still continues. After that visit, we returned and remained quiet for most of the afternoon. That night we had a lovely meal of domoda, a spicy groundnut sauce highlighted by beef and potato cubes. By that time the power came on and we retired to air conditioned bliss until bedtime. Within an hour something in the food or water caught up with Joanne; by 9pm she was ill, which was unrelenting through until 2am. We then both slept fitfully until our 4:30am rise and shine time. 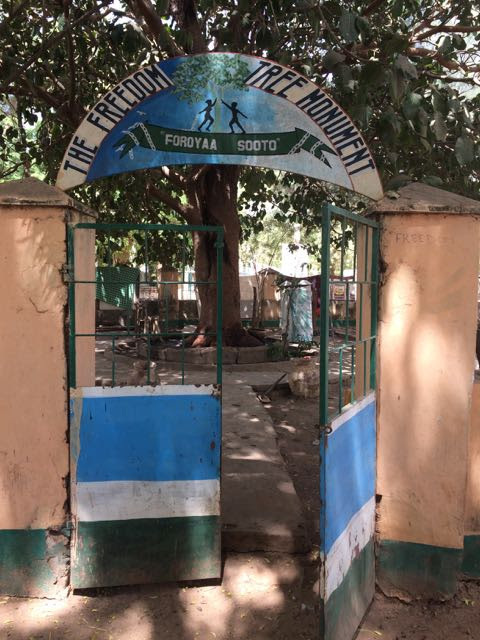 1 Response to #Love4Gambia – March 7 Update – Rest Day! !